Schoenberg Quartet - 30 years...! The Schoenberg Quartet was founded in 1976. The 30th anniversary was celebrated in 2006. The musicians of the Quartet (Janneke van der Meer and Wim de Jong, violins; Henk Guittart, viola; Viola de Hoog, cello) share a common interest in the composers of the Second Viennese School - Arnold Schoenberg, Alban Berg, Anton Webern and Alexander Zemlinsky - and the complete works for strings by these composers form the heart of their repertoire. However, their programmes range from the music of Claude Debussy and Johannes Brahms to that of composers of the present day, highlighting the music of the first three decades of the twentieth century. Besides concerts and broadcasts in The Netherlands, the Quartet has given performances in most European countries as well as in Canada and the United States. Its performances for Dutch television of Schoenberg’s eight works for strings were broadcast worldwide and the Quartet appears on the Rhombus film My War Years about the life of Arnold Schoenberg. Between 1983 and 1991 the Quartet worked frequently in Boston (U.S.A.), where it studied with the violist and famous quartet coach Eugene Lehner, formerly a member of the renowned Kolisch Quartet which in the 1920s and ‘30s worked closely with Schoenberg, Webern, Berg and Bartók. The Friends of the Arnold Schoenberg Institute in Los Angeles awarded the Schoenberg Quartet Honorary Life Membership in 1989, an honour previously accorded to artists such as Pierre Boulez, Felix Galimir and Eugene Lehner. The Schoenberg Quartet has issued a total of 27 CDs with works by Louis Andriessen, Brahms, Willem Breuker, Chausson, Dutilleux, Janáček, Otto Ketting, Pijper, Robin de Raaff, Reger, Roussel, Schulhoff, Shostakovich, Szymanowski, Bart Visman, Jan van Vlijmen and Mathijs Vermeulen. For Chandos the Schoenberg Quartet has recently recorded on 9 cd’s the complete works for strings by Schoenberg, Webern, Berg and Zemlinsky, a unique event in recording history. These recordings have received the highest praise in the international press. In 2002 the Schoenberg Quartet was nominated for a Grammy Award. 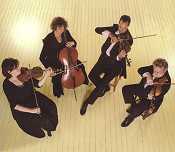 In 2007 their latest CD was released by Chandos, containing the string quartets of Janácek and Szymanowski.